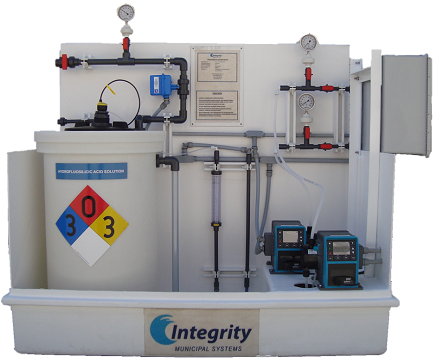 IMS chemical feed systems are pre-assembled, fully-functional chemical delivery systems for water treatment applications. 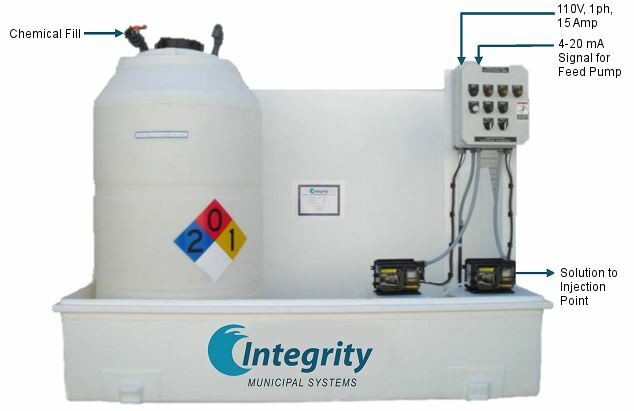 These compact, user friendly chemical skids include local storage tanks, full secondary containment, dosing pumps, instrumentation and controls. Systems are piped and wired at the factory for easy and quick hook-up. 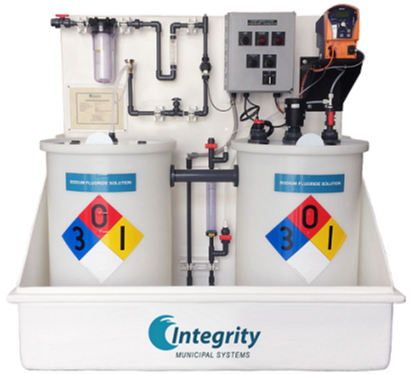 ​IMS Fluoride Feed Systems are used for community water fluoridation. They are designed with separate saturator and solution tanks to assure complete saturation, high reliability, low maintenance, and ease of use. Systems are sized to meet customer requirements. Please contact us here for more information on our Fluoride Feed Systems, product specifications, or a customized project quote. ​IMS Hydrofluosilicic Acid Feed Systems are used for community water fluoridation. They provide safe storage and accurate dosing of Hydrofluosilicic Acid, in a fully contained, pre-assembled skid. Packaged systems are pre-wired and piped with local instrumentation and controls. Please contact us here for more information on our Hydrofluosilicic Acid Feed Systems, product specifications, or a customized project quote. 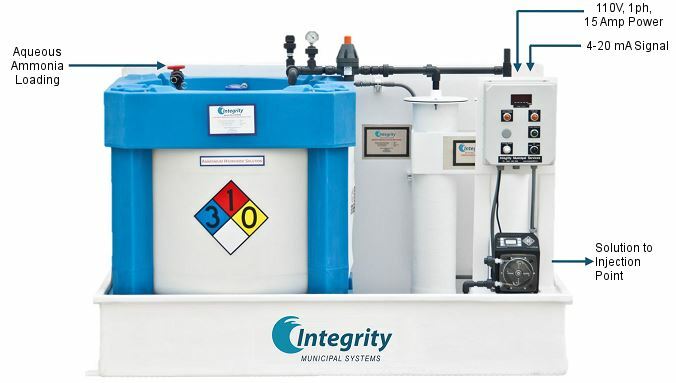 ​IMS Sodium Hypochlorite Feed Systems are used as an alternative to gaseous chlorine to provide disinfection of the water at the water treatment plant and distribution system. They provide safe storage and controlled, accurate delivery of sodium hypochlorite solution, in a fully contained, pre-assembled skid. Systems may be customized to meet user needs. Please contact us here for more information on our Sodium Hypochlorite Feed Systems, product specifications, or a customized project quote. ​IMS packaged Aqueous Ammonia feed systems are used in the formation of chloramines for disinfection within the treated water pipelines and distribution system. They include a heavy duty pressure rated aqueous ammonia storage tank, integral ammonia fume scrubber, peristaltic dosing pump, instrumentation and controls in a fully contained, pre-assembled skid. Please contact us here for more information on our Aqueous Ammonia Feed Systems, product specifications, or a customized project quote. 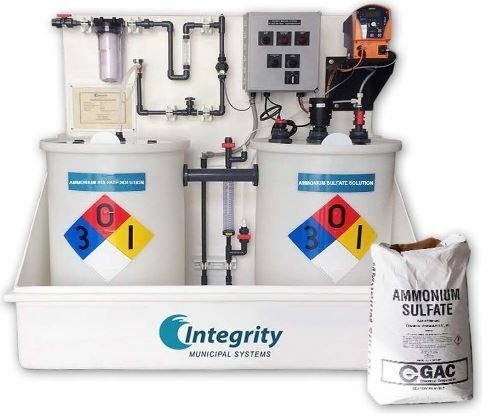 IMS packaged liquid ammonium sulfate (LAS) feed systems are used in the formation of chloramines for disinfection within the treated water pipelines and distribution system. IMS LAS Saturator and Feed System technology can reliably produce liquid ammonium sulfate solution from solid ammonium sulfate, decreasing chloramination chemical costs. The system is fully contained in a pre-assembled skid. Please contact us here for more information on our LAS Feed Systems, product specifications, or a customized project quote.